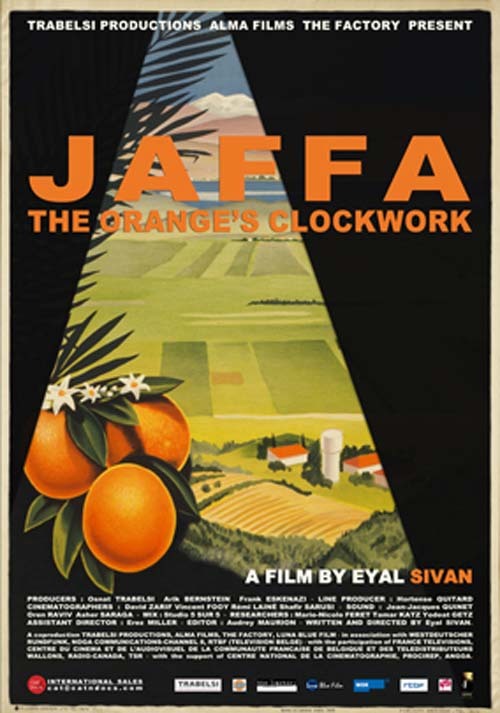 Jaffa: The Orange’s Clockwork is the new film by acclaimed documentary filmmaker Eyal Sivan (Route 181: Fragments of a Journey in Palestine-Israel (with Michel Khleifi), The Specialist, Izkor: Slaves of Memory). The film is a political essay excavating the entwined visual and political histories of that famous citrus fruit originating in Palestine and known worldwide as the "Jaffa Orange". While this orange has been translated into a symbol of the Zionist enterprise and even the state of Israel, for Palestinians it remains a powerful symbol of the loss and destruction of their homeland. By exploring the visual history of this brand, the film reflects on western fantasies related to the ‘Orient’ and ‘Holy Land’. It asks after the brand’s attachment to the state of Israel and unveils an untold story of what was once a communal symbol and industry shared by Arabs and Jews in Palestine. Visually captivating and politically bold, Sivan’s latest weaves a tapestry of archival material and interviews, ultimately asking what the Jaffa Orange’s past might offer for the future in Palestine/Israel.